Hello buyers, i will provide 1000+ Social Media Promotion Followers High Quality And Very Fast Complete With Our Best Work. *****Welcome to my service and profile. Thanks for coming.I am Expert on social media marketing service. I have been experience more than 3 years in marketplace. I have huge experience in online working. A lot of Orders Completed Experience. I will give real work with best quality to my all Buyers.If your needs any kind of SEO and SMM work. please contact with me. •Instant start and complete within 12-24 hours. •Get Professional work with extra bonus. •very quick delivery and quick response. 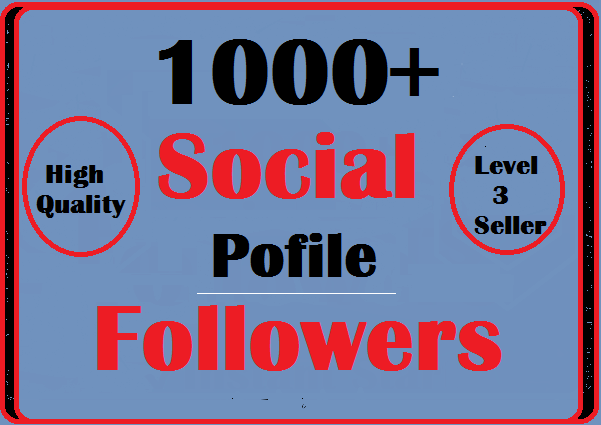 1000+ Social Profile Followers High Quality Instant Start And Very Fast Complete is ranked 5 out of 5. Based on 105 user reviews.